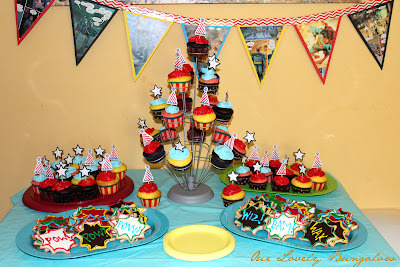 My good friend Samantha is expecting a baby boy in about a month so there was a baby shower to plan! I along with my other good friends Vicki, Bonnie, and Monet all played hostess for the special day. Sam and her husband decided to decorate the nursery with a super-hero theme so we stuck with that theme for the baby shower. It was a co-ed party so we also decided the super-hero theme would be guy-friendly too. I was mainly on decoration duty as it was something I could work on ahead of time as I'm an out-of-towner. 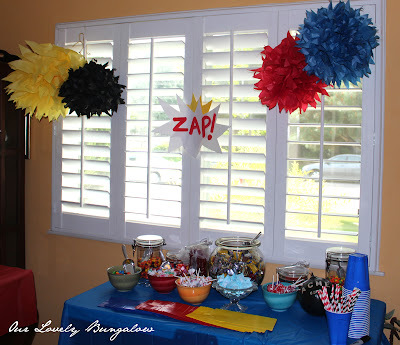 In a previous post I showed how I made tissue paper pom-poms in super-hero/comic book colors (red, blue, yellow, and black). 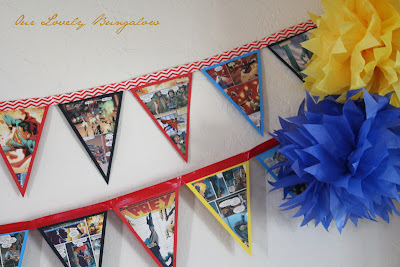 I also made a couple bunting banners out of comic books and poster board. I cut pennants out of poster board in red, yellow, blue, and black. 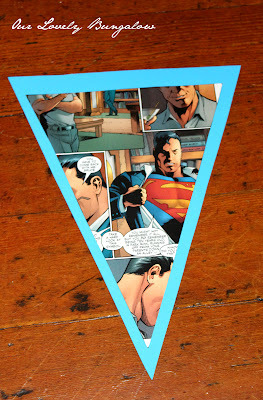 Then I cut slightly smaller triangles from comic book pages that I glued onto the poster board pennants. 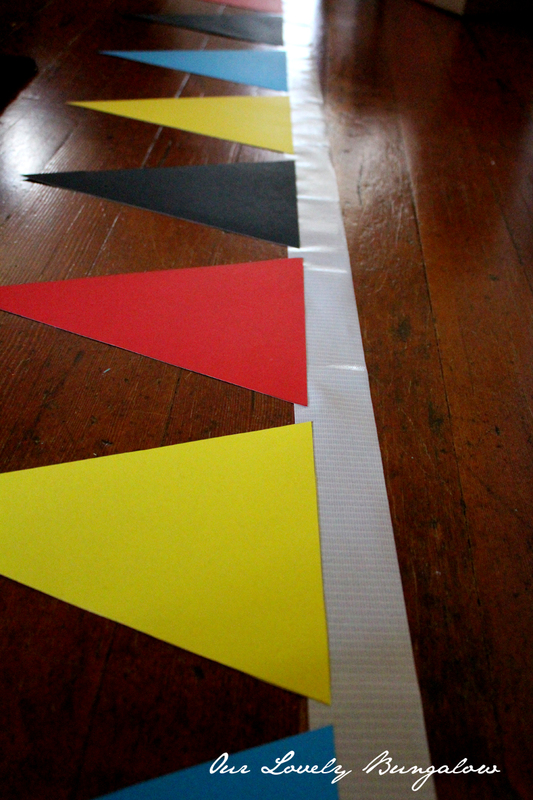 I then used duct tape to string the pennants together. I found some fun red and white chevron duct tape in Target's dollar area, but only one roll, so I had to use red duct tape for the second banner. 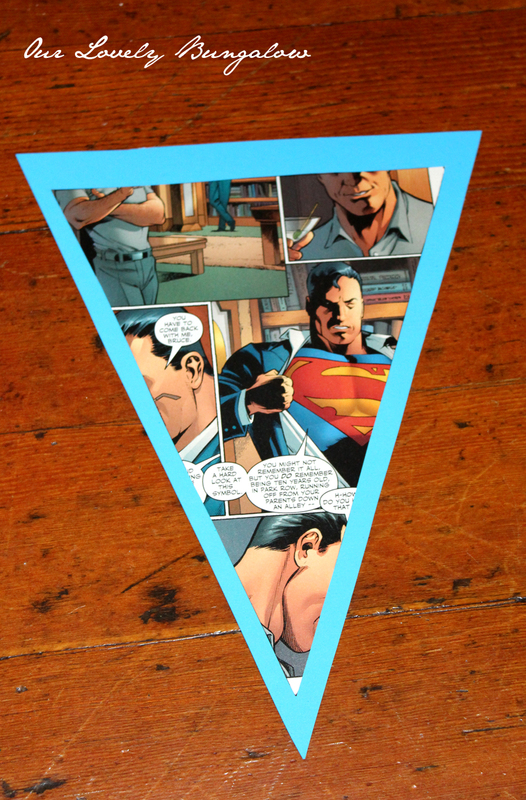 I placed the pennants comic side down onto the edge of the duct tape to prevent creases (as I figured out after the first banner) and then folded the duct tape in half with the pennant stuck between. I also made a "Baby Shower" banner, similar to how I made this Halloween banner, using comic book pages. I found plates and cupcake wrappers at Michael's that I thought fit the theme. Vicki baked and decorated some yummy lemon, strawberry, and chocolate cupcakes. I also bought a cookie cutter from The Cookie Cutter Company that Bonnie and Monet used to cut-out sugar cookies and label with words like "Pow! ", "Wiz! ", "Bam!". The cookie cutter is actually a spider web but I thought it would work for the action bubbles in comics. 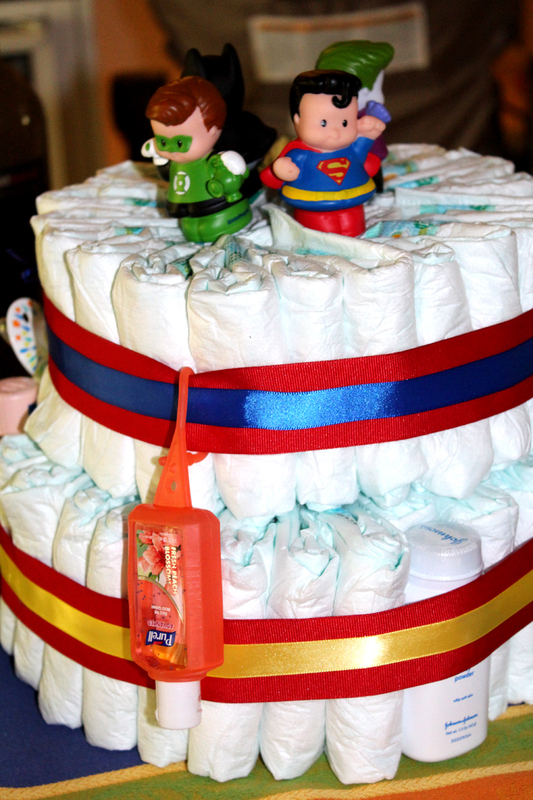 And Vicki made a super-hero diaper cake! 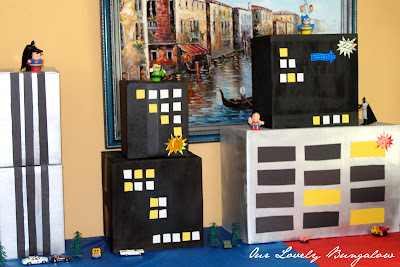 Where did you find the baby super hero figures?